Passenger Plane Crashes in French Alps. A plane carrying 142 passengers and six crew has crashed in the southern French Alps en route from Spain to Germany. The Airbus A320 disappeared from radar in the Alpes de Hautes Provence after sending a distress signal at 10.47am local time (9.47am GMT). Debris from the jet, operated by Lufthansa's Germanwings budget airline, has been found near Barcelonnette, according to the French Interior Ministry. French president Francois Hollande said that he did not expect there to be any survivors. Lufthansa were not immediately available for a comment. Airbus had no immediate comment. Germanwings today is the low-cost subsidiary of German national carrier Lufthansa, and was first branded in 2002. The company’s history can be dated back to 1997, however, when it was known as Eurowings. The airline’s main hubs are at Cologne Bonn Airport, Stuttgart Airport, Hamburg Airport, Berlin Tegel Airport and Dusseldorf Airport with further bases are Hannover Airport and Dortmund Airport. Lufthansa have announced that Cologne-based Germanwings will be going back to its roots and re-branding back to Eurowings in autumn this year. There are a total of 81 aircraft in Germanwings’ fleet, with an average of 9.2 years, flying to 86 destinations around the world. The fleet includes the Airbus A319, Airbus A320 and the Bombardier CRJ900. There had never been a fatal crash in Germanwings’ history until the reports of today’s tragedy. Back in December 2010, a Germanwings flight was said to be ‘moments from crashing’ after the pilots were overcome with fumes on landing at Cologne. The plane had 150 passengers on board, and officials accused Germanwings of ‘playing down the incident’ to ‘avoid investigation’. [+5] - Olivier5 - 04/03/2015[quote="hawkeye10"] [quote]Does "more whole" come to mind? [/quote] yes [/quote] The most charitable conclusion I can arrive at is: you don't know what you're talking about. [+3] - edgarblythe - 03/27/2015Walter Thanks for all of your work on this thread. I have been following, but not posting. [+3] - neologist - 03/27/2015That's a problem with murder suicide; the perps commit the acts in the wrong order. If they committed suicide first, we could probably give them a pass on whatever they did next. A German official says a high school group returning from an exchange in Spain was on board the Germanwings plane that crashed in the French Alps, killing all 150 people onboard. The school they had visited, about 45 minutes from Barcelona, told The Associated Press that 16 students from the town of Haltern in Germany had been on a weeklong exchange that ended Tuesday. North Rhine-Westphalia state Education Minister Sylvia Loerhmann said Tuesday that "we know that the school group boarded the plane," the dpa news agency reported. Local police said they are still waiting on official confirmation the students had been killed, but have already sent staff to the school to assist students and teachers. The school refused to comment. a witness account is towards the end of the article. 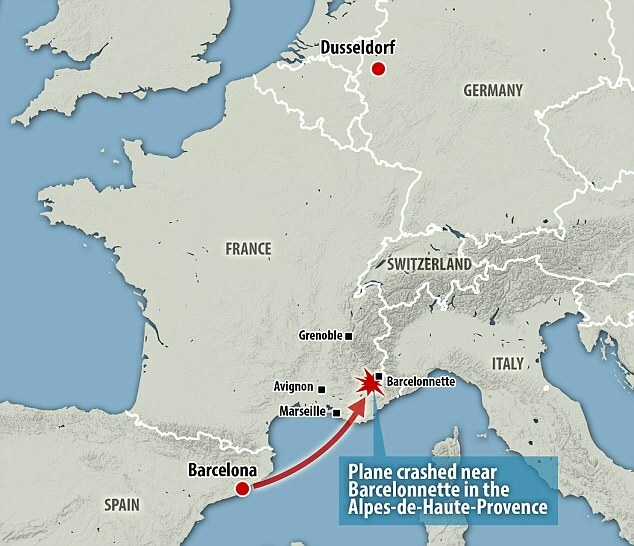 Apparently it crossed the French coast at a normal height of 31000 feet, but eight minutes later it crashed. It looks like the course remained straight and true throughout the rapid descent, which would indicate that something was drastically wrong, as Pilots usually have time to at least change direction in an effort to find somewhere to land. A black box has been retrieved, but at this stage the betting is on a sudden catastrophic event, leaving the pilots no time to radio in a mayday or take any other action. I have been to Barcelonette, a very pretty location. What a tragedy. It's hard to believe, short hauls across Europe are so routine you just don't think of the possible consequences. The model has had trouble with its altitude before, losing height because of a problem with sensors on the wing . This involves turning off some of the computerised systems so the plane can be manually flown . If this occurred at the same time as another problem, it would be a very dangerous situation . This is how they “persuade” German to join war with Russia in Ukraine conflict. I've been pondering what would make a plane descend in the manner that this one did, and the only thing I've been able to come up with is unconscious/dead pilots. I just got a news alert saying that one of the pilots was locked out of the cabin during the descent/crash. I'm not sure how they know, voice recorder maybe. Perhaps one of the pilots left the cabin briefly, and the other pilot happened to die of a stroke or heart attack right at that moment? "01.10 More on the report that one of the pilots was heard trying to force his way back into the cockpit. With the FBI having not, as yet, found any terrorist links among the passengers, the possibility that a pilot could have been incapacitated while his colleague was temporarily absent is becoming one possible theory." I have been reading your hypothesis about the building of a scenario where China and Russia may get involved in wars with neighbors. So far, hitting commercial airplanes won't cause any war, and less when the "shooter" is unknown. The amounts of money paid by insurance companies won't create a hard inflation for the host country. Your hypothesis lack of the spark which is needed to reach an armed conflict between countries. The conditions for war do exist, but the current events do not indicate a provocation for a possible armed conflict. However, in the past, even a dumb soccer game was used as an excuse for two countries following up the result of the game with a fight using troops, tanks, and bombs like crazy between their borders. Stroke or heart attack would be rare...yes, pilots leave the cockpit for comfort reasons all the time, even on a short trip . The co-pilot could be quite busy trying to fly in an emergency and letting the pilot back in is not the priority . "The co-pilot "deliberately" initiated the descent of the Germanwings flight that crashed into the French Alps and refused to open the door to the pilot who was outside the cockpit, the lead investigator said on Thursday. The co-pilot, named as 28-year-old Andreas Lubitz, appeared to "show a desire to want to destroy" the plane, prosecutor Brice Robin told reporters. "The co-pilot was alone at the controls," said Mr Robin, presenting information gathered from the "black box" recorder that records sounds and conversations from the cockpit. "He ... refused to open the door of the cockpit to the pilot and deliberately began the descent of the plane." I cant say if that is right or wrong, but I caution people about believing French Prosecutors when a French Company is involved . How does he know the pilot refused to open the door ? He says he "appeared to show a desire to want to destroy" the plane . What exactly shows a desire to destroy a plane ? "... deliberately began the descent of the plane." How do they know it was deliberate ? I have been involved in aircraft incident investigations and crash recovery and I have to say the prosecutor is making very strong claims . We need a copy of the voice recording to be released . It wouldnt be the first time corruption had played a part in an accident investigation . I've been thinking about this, and although the co-pilot is almost invariably the younger of the two, if he was incapacitated, and if they had not set the switch for the code to be entered on the panel to enter the cockpit, then slumping forward in a seat belt might just have put the right pressure on the yoke for the aircraft to dive . "On 5 November 2014, Lufthansa Flight 1829, an Airbus A321 flying from Bilbao to Munich when the aircraft, on autopilot, unexpectedly lowered the nose and entered a descent reaching 4000 fpm rate of descent. The loss of altitude had been caused by two angle of attack sensors having frozen in their positions during climb at an angle, causing the fly by wire protection to assume the aircraft entered a stall while it climbed through FL310. The Alpha Protection activated, forcing the aircraft to pitch down, which could not be corrected even by full back stick input. The crew eventually disconnected the related Air Data Units and was able to recover the aircraft. The event was also reported in the German press several days before the Germanwings crash." ""At that moment, the co-pilot is controlling the plane by himself. While he is alone, the co-pilot presses the buttons of the flight monitoring system to put into action the descent of the aeroplane. "This action on the altitude controls can only be deliberate." My understanding of automatic pilots (and there is a great deal of variation) is that they all can be manually overridden as a safety measure, the belief being in an emergency you don't want to be fumbling for the off switch . I have read several reports of what the prosecutor has said and I think he is an idiot . He is making outlandish claims that are not backed by evidence . Does anyone know what a prosecutor is doing on an investigation board ? Before a decision is reached by a neutral investigation ? » Passenger Plane Crashes in French Alps.